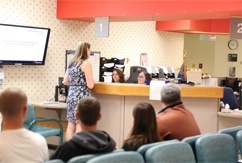 We update our triage criteria, referral process, average wait times & contact information on a quarterly basis to ensure the latest information is available. The Division of Geriatric Medicine provides secondary and tertiary care to frail elderly patients throughout Nova Scotia and the Atlantic provinces. Our division is committed to providing outstanding care, to improving patient safety and to conducting research that informs care decisions and protocols. Many evidence-based care innovations developed by the division are considered gold standard for the treatment of frail elderly patients everywhere. Our division offers a consultation service at the Dartmouth General Hospital, as well as satellite geriatric clinics in various communities across Nova Scotia. Our geriatricians offer home visits in order to assess housebound patients and elderly patients in their own homes. We also offer nursing home visits to provide expert advice on care issues in individual nursing home patients.